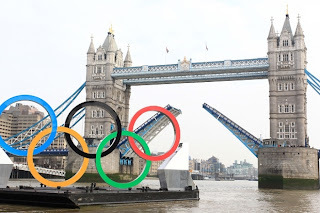 Its time for the London Olympics. Will Channel 9 do better that the debacle of Channel 7's broadcast of the 2008 Olympics? Or go they possibly sink Aussie tv even lower? The 2008 Olympics are remembered for Channel 7's terrible broadcast which insisted on showing their crap shows instead of the world biggest event. Being a prime time Olympics, it was always going to be too much for 7 to part from their usual schedule of Today Tonight. Showing stories about heartless Councils fining pensioners wins out every time over showing Michael Phelps winning the Gold. Good choice Channel 7 Execs. Evidently 7 only got the Olympics so Channel 9 couldn't. Fast forward to now and its time for London 2012. Channel 9 has the rights this time. Will they actually show the Olympics which they undoubtedly paid millions for? Or is it too great an ask to not show the Footy Show for two weeks? One thing that is dead certain is the saturation advertising of Underbelly Badness they will force us to endure. The lead actor better get some real gangsta links, because people will be out for his blood after having him plastered all over their tvs at every ad break for 2 weeks straight. One absolute certainty will be the attempted Aussie angle on any event which doesn't involve an Australian. That is if its shown at all. Just like our international news which desperately looks for the Aussie angle in covering Bastille Day celebrations from Paris, so too will the Olympic coverage attempt to put the Australian spin on anything and everything in this so called 'world event'. Lookout for the "Aussie Connections" in any sport not involving an Aussie. Jana from the Ukraine, who's brother once came to Australia on a holiday will be renamed "Aussie Jana", despite the fact she thinks by that Australia we mean Austria. Are the Australian public so nationalist and xenophobic that they can't bare to watch anything that doesn't involve a fellow Aussie? Our tv networks certainly think so. Is this a Channel 9 boardroom conversation? "Usain Bolt? Sounds like a foreigner to me. World Record? What about the Australian Record?" There are hundreds of Aussie athletes competing in London, and congratulations to all of them for making it, but forgive me if I’d rather watch Usain Bolt, the US Basketball Team, Michael Phelps or the British Football Team than some Aussie being smashed in the first round of the badminton by Chinese Taipei. Of course, failing the Aussie connection, wait for the heartwarming story about how some town in East Backwater Nowhereville in central Qld held a fundraiser at the local pub so that Granny could fly to London to watch young Johnny be the cox in the rowing. But lets be honest, just because they are Australian, it doesn't make them likable. Nobody but nobody wants to see the petulant gits, Tamsyn Lewis and John Steffensen. Their inevitable attention seeking tantrums, and self inflated egos which are only matched in size by the margin they'll lose their race are unbearable. Even to see them lose wouldn't be satisfying, as they shouldn't be there in the first place. And who could forget the two bozos from the swim team, the one who fell off his skateboard and broke his arm, and the other who used his government funded training, fitness, and strength to sucker punch a team member to a bloody pulp. Go team! Speaking of the Aussie spin, one thing that we can be eternally grateful for is that we wont have to put up with is channel 7’s roving reporter who’s name escapes me (Curly, Curny or something). The concoction of this guy's over-exaggerated Aussie accent and his ridiculous questions to confused athletes who are trying to figure out if he’s speaking English between his G’days, Mates and Aussie clichés are enough to make you move to North Korea for their superior and more balanced media coverage. This simpleton is in his element in the Olympics, where after seeing a sport he doesn't know or understand (making it whimsical and stupid), he asks seasoned athletes from non-Australian countries who have just won a Gold medal: “G’day mate, wow, you were high off the ground in the pole vault weren't you?” The polite nods he gets from these athletes as they edge away to speak with real reporters shows the esteem that 7’s man Curly is held. Of course to try to avoid showing too many foreigners, we can expect usual trick of flicking between events in order to show every single Aussie competing. Is there anything more infuriating watching your tv switch from a shot at goal in hockey to heat 3 of the 400 meters to a free throw in basketball to a bullseye in archery to a serve in volleyball to an attempted high jump to a dismount from the uneven bars in gymnastics to a shot of Anthony LaPaglia in Underbelly Badness, all within a seizure-inducing 2 minutes? An Australian Olympic broadcast just wouldn't be complete without references about how Sydney 2000 did it better. Or naive commentators comparing fringe foreigner sports which Australians don't win Gold medals in such as basketball, volleyball, or gymnastics to AFL or NRL. Or naming which ever female swimmer wins Gold as our newest Golden Girl. But this year we also have the hope that Channel 9 may actually use its multi channels to give us something close to what we could expect with 2012 technology. Could they possibly dare to upset the 6 people that actually watch Channels Gem and Go by foregoing the screening of Bewitched and Green Acres repeats, and show the Olympics on those channels? And wait for it - Yes, if the Olympics are shown on Channel Gem, they may even be in HD. Imagine that, sport in HD! The future is now. (by future I mean 2007). So the stage is set, London 2012 is days away, and Channel 9 are promising us multi channels, HDTV, 3D coverage and all the bells and whistles. Will they deliver?